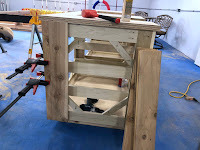 Grill cabinet progress... I made a start on installing the cedar sheathing yesterday (photos below). Each tongue-and-groove piece is glued and screwed in from the back side. I'm not happy with the screws; they're not gripping well in the (relatively soft) cedar. Starting this morning, I'm going to nail them in the conventional fashion (nails hidden in the tongue section). In the second photo you can see one end panel completely sheathed. It looks great already; should look even better after sanding and varnishing. A fellow from our granite vendor came out yesterday morning to “template” the countertop. Basically that means making a very precise measurement of the surface the granite will sit on. First he measured the flatness of the plywood top, using a laser tool. 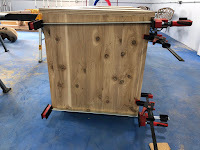 If the top wasn't perfectly flat, they'd need to either flatten the plywood (using a belt sander) or match the contours by grinding the granite's bottom (expensive!). 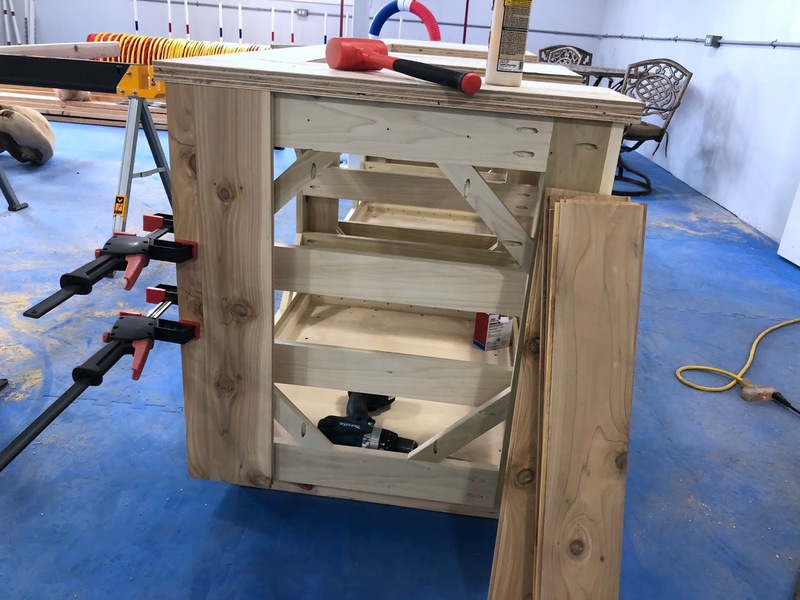 My cabinet top was so flat that no corrections were needed at all – something he told me happens only once out of 20 or so cabinets he measures. Nice! Then he used a fancy tool that measures the exact dimensions of the actual countertop. This becomes the template that they use when fabricating the actual granite. We're scheduled for delivery tentatively on June 25. I have a busy day here today! Along with hopefully making more progress on the cabinet, I have to go buy some T-posts and fence wire, a Tesla technician will be here to repair some broken brackets in the luggage area, and contractors will be here to work on our landscaping, on our lawn, on my office air conditioning, and on installing the natural gas feed for the grill. Lots of balls in the air!